A 1931 Cadillac Golfer's DHC once owned by Liberace and a McLaren Mercedes lead the line up for Barons Classic Auction at Sandown Park on 17th September. 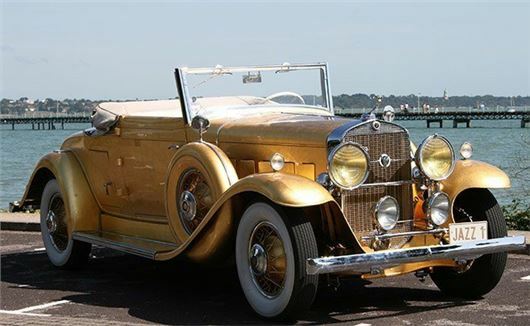 The unique gold-leaf clad 1931 Cadillac Golfer’s Drophead Coupé (believed to have once belonged to the flamboyant pianist Liberace) is estimarted at £85,000, while a LHD 2006 Mercedes McLaren SLR is estimated at £116,000-£120,000. Barons also has a bronze-coloured 1967 Chevrolet Corvette Stingray 427. This is from the final year of production for the C2 model and has had just three owners from new. Estimate: £65,000-£75,000. And for Corvette fans with slightly smaller budgets, there's the 1974 Corvette C2 350 (£8,500-£10,000). There is also an interesting MGBGT V8 with MGC bonnet and featuring a bespoke interior with Bulgari dash clock and Moto-Lita steering wheel. Estimate: £9,000-£11,000. Other entries include the 1999 Ferrari 360 Modena (£32,000-£35,000), the 1964 Mercedes-Benz 220SEB coupe (£19,000-£21,000), the 1963 Alvis TD21 S2 Saloon (£16,000-£20,000) and the very handsome 1980 Mercedes-Benz 380 SLC (£7,250-£8,000). There are also some very splendid Jaguars and Daimlers - including a rare and fast 1977 Jaguar XJ 5.3C (£7,000-£8,000), a charming 1952 MG TD MkII (£8,000-£10,000) and a charismatic 1965 VW 'Splitty' Camper Van (£18,000-£22,000).